Tottenham Hotspur has reported record profits after making big gains from selling its players. The football club said pre-tax profits jumped to £33.4m for the year to 30 June, up from £3m the previous year. Spurs made a record player trading profit of £56.5m, up from £16.4m in 2008, on sales of players, including Dimitar Berbatov to Manchester United. The club recently submitted a planning application for a new 56,000-seat stadium. Spurs said the money it had made had been reinvested in strengthening its squad. "We have assembled what we believe to be one of the most talented squads we have had during our time in the Premier League," said Spurs chairman Daniel Levy. The trading profit of £56.5m is derived from the sales of players based on the value the club assigns on its books, not simply what they were bought and sold for. That is because profit is booked as a one-time gain, whereas the value of players is written down over the life of their contracts. For example, a player that comes up through the youth ranks would be nominally valued at almost nothing and sold for pure profit. During the year, the club sold players for a total return of £72.5m, while it spent a total of £119.3m on players such as Luka Modric, Heurelho Gomes and Roman Pavlyuchenko. The club finished eighth in the Premier League at the end of last season, following its worst start to a season in club history. Media and broadcasting revenues increased by 11% to £44.8m. 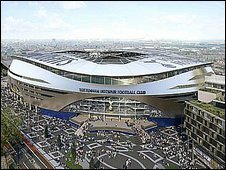 The club said leasing of corporate boxes and lounge memberships at White Hart Lane had fallen because of the recession. Spurs, which has 23,000 club members on the waiting list to buy season tickets, also said merchandise had seen a "flattening out" of sales. The club has now agreed partnerships with Brazilian club Sport Club Internacional "that will enable us to track emerging talented players from Brazil and the rest of South America". It also concluded tie-ups with US football club San Jose Earthquakes and South China in Hong Kong.